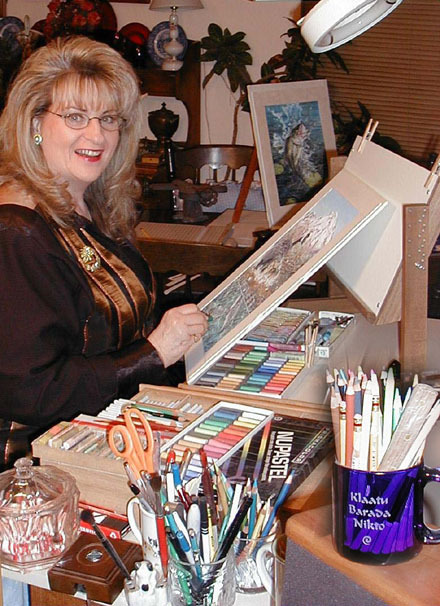 Mrs. Baer is an outstanding Nationally recognized artist who specializes in the medium of pastels. She has recently been elected Signature Status by the Pastel Society of America. With this honor comes the distinction of signing PSA on all of her originals, prints, and correspondence. She has also enjoyed the title of "Artist of the Year" for Quail Unlimited while at the same time winning the contest to artistically represent the world famous architect Santiago Calatrava's Sundial Bridge in Redding California. Her early love of nature, which includes fishing the Sacramento River and surrounding rivers and streams, combined with an exceptional natural talent makes for paintings that are filled with movement, striking grace and unbelievable micro-photographic realism. Mrs. Baer's work has been the center of media interviews, and is currently being displayed in numerous Galleries.